LIVERMORE -- Disaster movies from "Deep Impact" to "Asteroid" to "Armageddon" have mined drama from the mortal threat humanity could face if a massive asteroid were speeding towards Earth. At Lawrence Livermore National Laboratory, scientists are taking that disaster scenario seriously and working on a plan to prevent it. 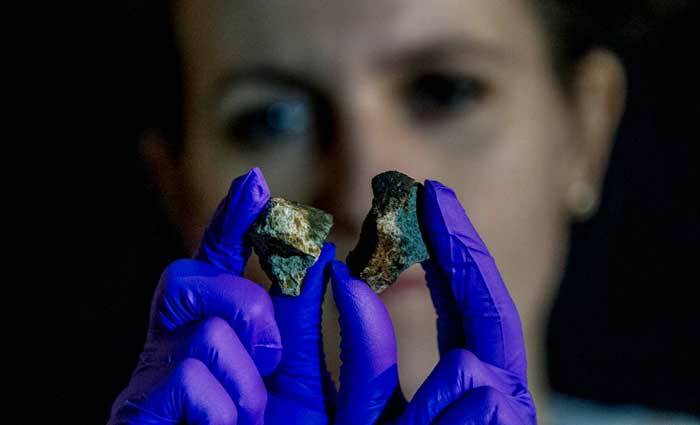 To save mankind from a doomsday collision, planetary scientist Megan Bruck Syal is working with small meteorites -- space rocks formed at the dawn of the solar system that drifted through space for billions of years before crashing into Earth. "Nobody has really looked at meteorites in this way before, under these high-pressure conditions, so we're doing something new and it's difficult in a lot of ways when you do something new," Bruck told CBS San Francisco. "[They] came a long way and we're pretty lucky to get to use them," she added. Using them also means destroying them, because Syal and her team are considering two possible ways to deflect a killer asteroid. On option is to use what's called a kinetic impactor, which is basically a spacecraft to ram the asteroid and push it off-course. The other option is a bit messier -- a so-called standoff nuclear explosion. This would involve detonating an atomic bomb at just the right distance from the surface -- but not so close as to break it apart. "Just the uppermost layers of the surface are heated to high temperatures and blow off in a vapor and the rest of the asteroid recoils in the other direction -- so you're keeping the bulk of it intact," Syal explained. "It's just the surface that's being vaporized and coming off." It's not a good idea to go nuking asteroids without knowing how they'll respond, so scientists are simulating the process using powerful lasers to create a high-temperature plasma to annihilate the meteorite specimens. "The results from this will feed directly into the numerical simulation -- will head into the supercomputers here at Livermore -- to see how an asteroid would actually respond to a standoff nuclear blast or a kinetic impactor," she said. These aren't the only options scientists have considered. There are some less-violent strategies. There's the so-called "gravity tractor," which would use a relatively small mass, possibly even a piece of the asteroid itself, to nudge it into a safe solar orbit. Even the feather-light touch of a laser beam might supply enough pressure to push an asteroid off-course. But those options take years of planning and execution, so if time is short, going nuclear might be humanity's best hope. "We want to be prepared in the event there is an emergency and we need to act quickly and advise the decision-makers based on high-quality science," Syal said.